Katamino - A Puzzle for One or Two! 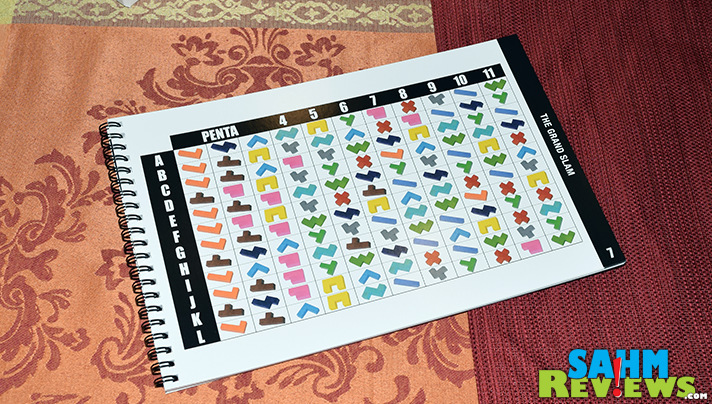 Home / Recreation / Games / Katamino – A Puzzle for One or Two! Katamino – A Puzzle for One or Two! When we’re not playing board games, you can usually find us working on a puzzle. There’s something satisfying about solving something that most consider too difficult to attempt. Nicole grew up with jigsaw puzzles, receiving at least one every Christmas. My brother and I anxiously waited for our subscription to Games magazine to arrive each month. And today you can find our youngest quickly solving the latest wooden or blacksmith puzzles we find at Goodwill. 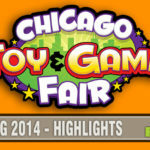 Lately we’ve been challenged by some really great titles by ThinkFun. Balance Beans, Circuit Maze and even an Escape Room have all made it to the table over the past few months. 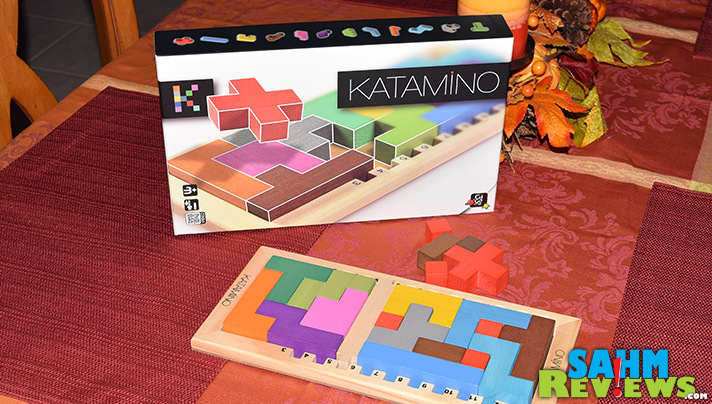 What we didn’t realize is one of our favorite publishers of abstract games, Gigamic, also has at least one puzzle challenge in their library – Katamino! And while most of these types of games are for solitaire play only, Katamino gives you a bonus of being designed for one or two players! 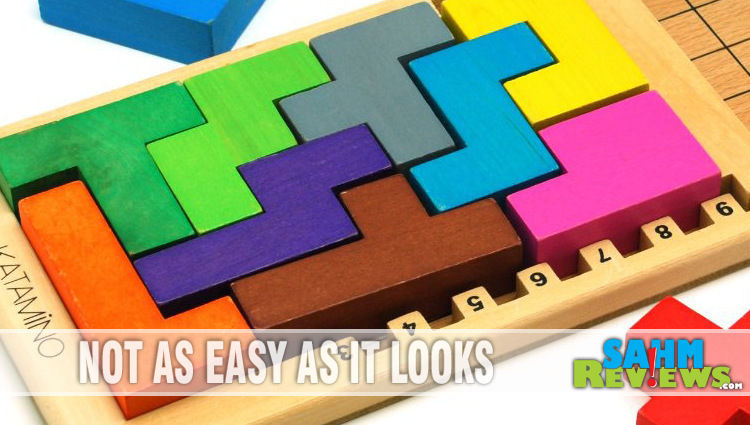 How does one design a game that is easy enough for a pre-K child, yet still challenging enough for an adult? You make it so you can choose a custom level of difficulty each time you play. 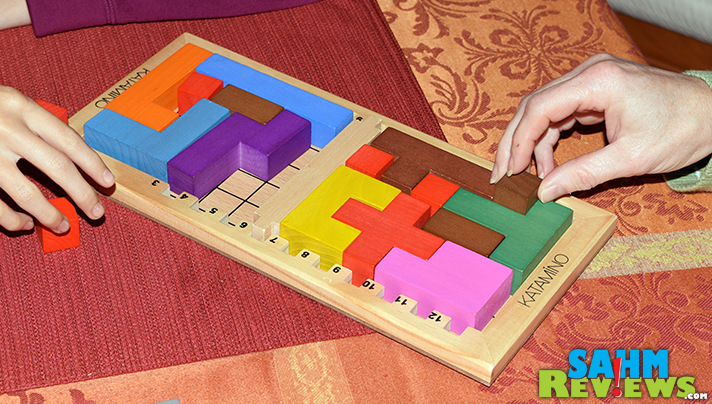 Katamino uses a wooden separator that varies the size of the playing area. The larger the area, the more difficult the challenge. Each possible size is accompanied by a dozen or more different challenges listed in the instruction book. Using only the pieces shown, you must make them all fit into the allowed play area. Choosing a difficulty level like “Super Slam” requires you to complete the 84 Pentas shown (5 through 11, twelve of each) in order to claim victory. Included in Katamino are eight different difficulty levels, certainly enough to challenge every age group. 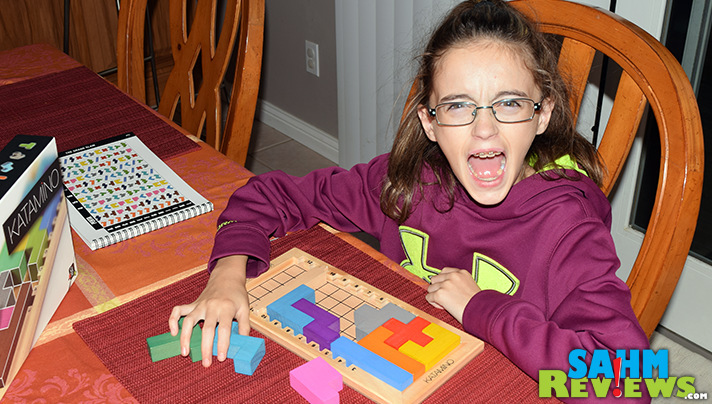 There are no rules on how to place the pieces on the board, with one exception. 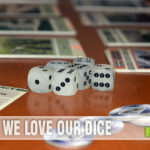 Any piece can be rotated or flipped except for the #1 piece (long, straight piece) which must be played horizontally. It is entirely possible to find more than one solution for each challenge, but none of them will be easy! But as I mentioned earlier, Katamino also has a unique challenge mode so you can test your speed against another player. The slider is positioned in the middle of the board so each person has the same size playing area. One player takes the maroon rectangle and three small red squares while the other receives the other maroon rectangle, a maroon square and two small red squares. The rest of the pieces are left in a pile which either may take from. 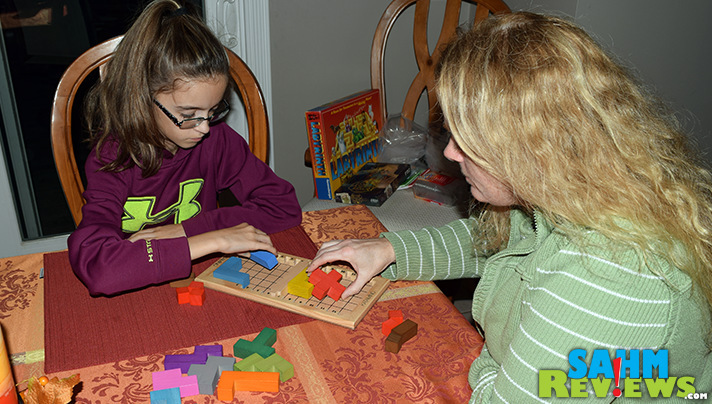 At the same time, both players try to use their pieces and any they grab from the pile to completely fill up their side of the board. We instituted some house rules to make things a little fairer, like only being able to grab one at a time. The first player to complete their side wins the round! 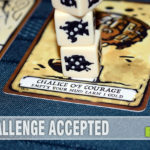 We found Katamino’s challenge mode to be played best two out of three. Available on Amazon for a very reasonable price of around $30, a bargain considering this is a wooden game. There’s also a plastic travel version for under $20 that will keep you occupied on your next trip to Essen! And thanks to our friends at Gigamic, you can win one for yourself right now! Enter using the form below and don’t forget to come back each day for additional entry opportunities! Seek and You Shall Find. Monthly. Played this once in the waiting room at a clinic. Really nifty! Fingers crossed. I enjoy all kids of puzzles. Growing up I did our puzzles enough I did them face down. I had a relative that always brought the small wooden/metal physical puzzles. Rubik’s cube never enticed me too much. I also enjoy puzzle like board games. 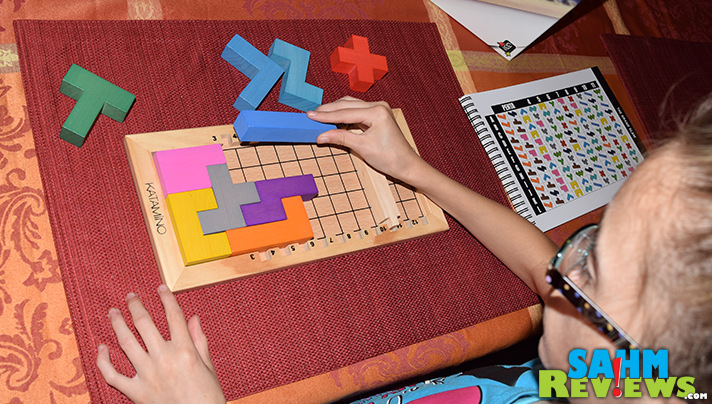 Looks like a great puzzle to help with the kids’ spacial reasoning. looks awesome! I love puzzles that say match this with these shapes. I also like word searches sometimes! I am a big fan of puzzles. They are one of my favorite things to do. I like wooden toy puzzles, and picture puzzles about 1,000 pieces. My favorite puzzles are jigsaw puzzles. 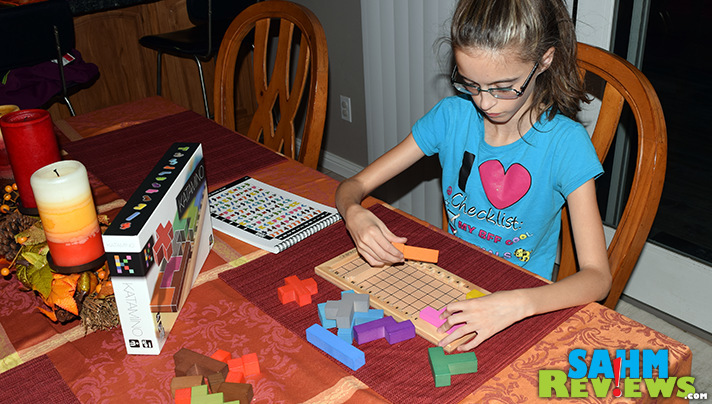 We like many different kinds of puzzles from jigsaw, word, math and logic puzzles. I like jigsaw puzzles, logic problems, and crosswords. I enjoy all kinds of puzzles. My daughter is just starting to reach the right age for these types of puzzles. This one looks great! 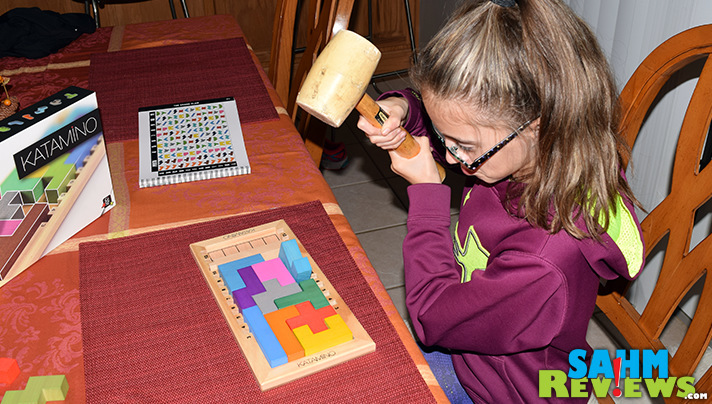 I enjoy so many different types of puzzles; word find puzzles, jigsaw puzzles, Rubik’s cube puzzle.. but I think my absolute favorite is Tetris puzzles! Great game for the whole family!!! 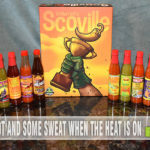 I like jigsaw puzzles the best.But any kind that is fun for all of us in my family is good too. I think wooden puzzles are fun to work with. I love logic puzzles and have loved them for YEARS. Thanks for the chance to win this one! I used these in my classroom when I taught school. They are challenging!